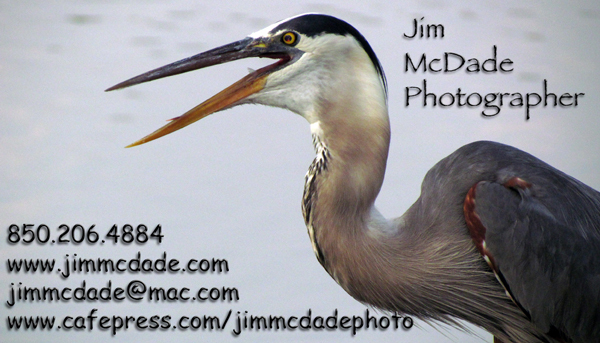 Jim McDade, Photographer – Page 30 – We don't "take" photographs. We are "given" images. And, if we're lucky, we get to capture and hold them for a little while. Recently, as I was giving my standard lecture about taking digital pictures, the words just popped out of my mouth. It was what you might call an epiphany (a moment of sudden revelation or insight). “Think of it this way,” I said. “Until you press the trigger button half way down, your camera has absolutely no idea what you want it to do! It’s like if you pulled up to the ATM at your bank, looked directly at the machine and said “I want some money.” Yes, the ATM machine is working. Its little screen is flashing. (And let’s assume that you have a few bucks in your account!) But, believe me, it didn’t see you coming, recognize you, and assume that you needed to take $30 out so you could scoot over to Mickey D’s for a quick, nourishing lunch then over to the grocery for a six pack and a dozen eggs. And, in much the same way … Yes, you’ve turned the camera on, removed the lens cap, and pointed it in the general direction of whatever it is you want a picture of. But – just like the ATM – something else has to be done before the camera will deliver that hoped for image. The ATM needs information – your debit or credit card and your PIN. And then you have to punch in the numbers so that it can deliver your much needed cash. Right? Your digital camera needs critical information too. And it CANNOT begin gathering that information UNTIL you press the trigger button half way down. NONE of these things happens UNTIL YOU PRESS THE BUTTON HALF WAY DOWN! Of course, full size DSLRs are faster – some of them are instantaneous. But point & shoots – even the best ones, like my Canon SX30is – still need that split second after you press the button half way to get themselves ready to shoot.